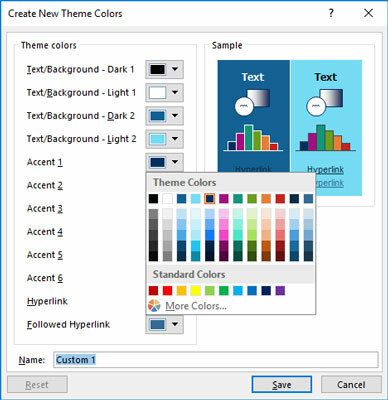 The Themes group of the Design tab lets you select a theme to apply to your Microsoft PowerPoint 2019 slides. PowerPoint 2019 comes with a ton of carefully crafted themes that give a professional look to your presentations. If you’re somewhat artsy, you can design your own themes, as well. 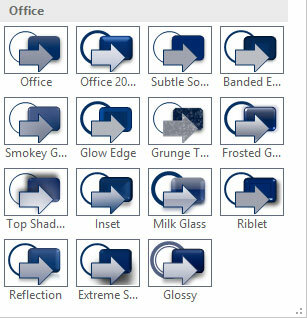 Office includes about 40 predefined themes, but the exact count changes from time to time as Microsoft’s designers come up with new ideas and retire old ones. Each theme is available in four color variations, so there are well over 100 pre-defined theme variants you can apply to your slides. 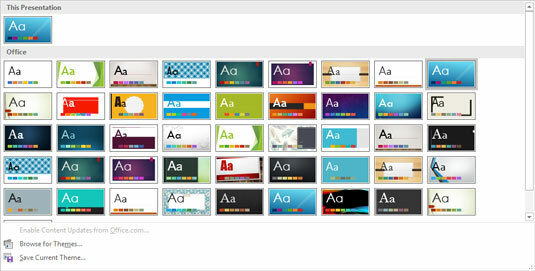 Each PowerPoint theme includes a built-in color scheme, which consists of sets of colors chosen by color professionals. Microsoft paid these people enormous sums of money to debate the merits of using mauve text on a teal background. 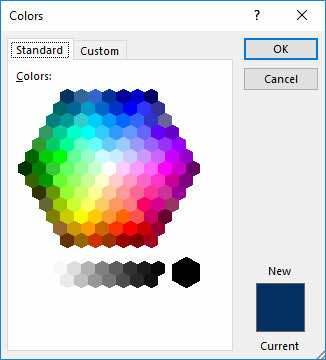 You can use these professionally designed color schemes, or you can create your own if you think that you have a better eye than the Microsoft-hired color guns. 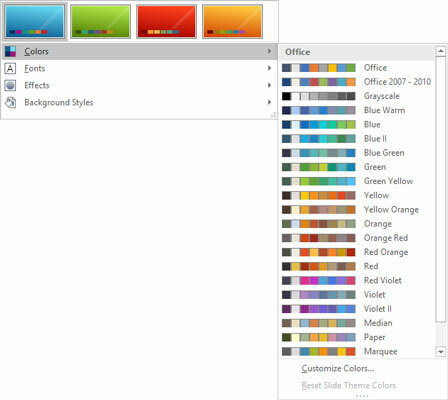 As far as I’m concerned, the color schemes in PowerPoint themes are the best things to come along since Peanut M&Ms. Without color schemes, people like me are free to pick and choose from among the 16 million or so colors that PowerPoint lets you incorporate into your slides. The resulting slides can easily appear next to Cher and Lindsay Lohan in People magazine’s annual “Worst Dressed of the Year” issue. To change the standard color scheme used for your slides, select a theme. Then click the More button at the bottom-right corner of the Variants gallery in the Design Tab and click Colors. This exposes the available color variants, as shown here. 1. Select a color scheme that’s close to the one you want to use. 2. Select Customize Colors from the bottom of the color variants list. 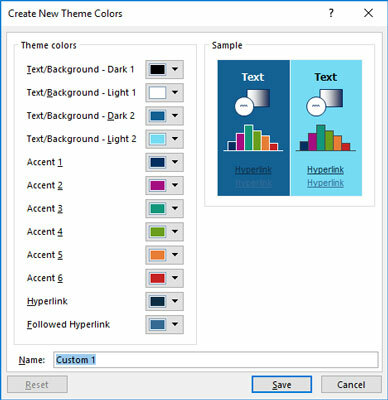 The Create New Theme Colors dialog box appears, as shown. 3. Click the button for the color you want to change. For example, to change the first accent color, click the Accent 1 button. You then see a gallery of color choices, as shown. 4. Pick a color you like. As you can see, a plethora of color choices is available. This gallery reminds me of the shelf of paint color chips in the paint section of a hardware store. 5. If you don’t like any of the choices, click the More Colors button. 6. Click the color that you want and then click OK.
7. (Optional) Repeat Steps 3 through 6 for any other colors you want to change. 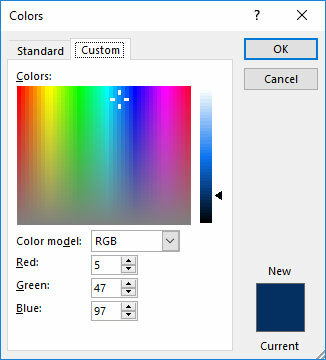 The Standard tab of the Colors dialog box (refer to Figure 8-6) shows 127 popular colors, plus white, black, and shades of gray. If you want to use a color that doesn’t appear in the dialog box, click the Custom tab. This step draws forth the custom color controls, as shown in Figure 8-7. From this tab in the dialog box, you can construct any of the 16 million colors that are theoretically possible with PowerPoint. You need a PhD in physics to figure out how to adjust the Red, Green, and Blue controls, though. Mess around with this stuff if you want, but you’re on your own. Theme fonts are similar to theme colors, but theme fonts have fewer choices. Although there are 12 colors per theme, there are only two fonts: one for headings, the other for body text. If you don’t want to use the fonts associated with the theme you’ve chosen for your presentation, you can change the Theme fonts in the ribbon’s Design tab. Then, the fonts you select are applied throughout your presentation. Note that changing the theme font is not the same as changing the font via the Font controls found in the Font group of the Home tab. When you use the Font controls on the Home tab, you’re applying direct formatting. Direct formatting temporarily overrides the font setting specified by the theme. As a general rule, you should use theme fonts to set the fonts used throughout a presentation. Use direct formatting sparingly — when you want to create a word or two in a font that differs from the rest of the presentation. You can change the font used in a theme by clicking the More button at the bottom-right of the Variants gallery, choosing Fonts, and then choosing Customize Fonts. Doing this brings up the Create New Theme Fonts dialog box, as shown. Here you can change the font used for headings and body text. Another major component of PowerPoint themes are the theme effects, which apply subtle variations to the graphical look of your presentations. Theme effects are applied automatically whenever you apply a theme. However, you can apply theme effects from a different theme by clicking the More button at the bottom-right of the Variants gallery and choosing Theme. This brings up the Theme Effects gallery, as shown. You can choose any of the theme effects listed.